Keith: One of the hardest English foods to get in America, I’ve found, is the pork pie. 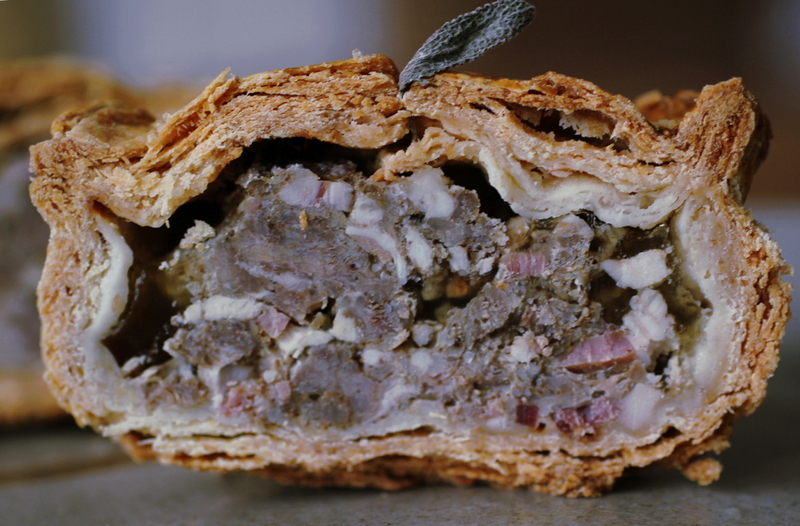 If you haven’t had one, think of the pork pie as the northern cousin of the pasty (and you can’t walk through Mineral Point without tripping over a pasty). Even as my beloved Scotch egg becomes more and more common in restaurants, pork pies are still few and far between. Because I’m not much of a baker (dough and I historically have not played well together), I never really thought of making my own. Luckily, Leslie loves kitchen experiments and she decided to take on this delicious project. While she did all the hard work I got to keep trying samples and giving advice to recreate the proper pie. Here’s hoping it becomes a yearly tradition. Leslie: I first made these pork pies two years ago. It was really fun to place my pork-centric order with Lois at Marr Valley View Farms. I asked for pork shoulder, lard, pork bones, trotters, pork belly, and bacon! Even better was the actual process. There are several steps to to make these delicious meaty treats which we will divide into 3 segments. It is quite time consuming but I guarantee that your taste buds will be pleased. I followed Nigel Slater‘s recipe except for replacing the regular bacon with smoked bacon and adding a bit of salt into the meat (right before filling the pastry). I. Start by making the filling, chop up the meats into small cubes or use a meat grinder. You’ll get better texture doing it by hand but it is a lot of pork to cut up. I’ve done it both ways and it’s not a huge difference. Add the spices, wrap it up and store in the fridge. II. Next is the pastry. Place the lard and water into a small sauce pan and bring to a boil. Set aside. Measure the flour and place it into a bowl. Add the hot lard and water into it. Mix until it is incorporated. III. Make the stock. Put the pork shoulder bone, trotters, vegetables, peppercorn and salt into a stock pot and cover with cold water. Bring to a boil and simmer for about 3 hours, skimming off the scum that forms on the surface, and topping it up with more water as necessary. After it has cooled a bit, strain the liquid so you have a clean broth. Refrigerate overnight. The liquid should have turned into jelly with a coating of fat on the surface. Carefully scrape off the solid fat and discard. *The first 3 sections can be done a day ahead of time. The second day can be the forming, baking, and eating time. I suggest going about it this way. Now that you’ve got all the components, it’s time to make the pies. Make sure the pastry is at room temperature so that it’s easier to work with. If freshly made, wait a bit until it is cool enough to handle. Set oven temperature to 356 degrees Fahreheit. There are many ways to form the pies. 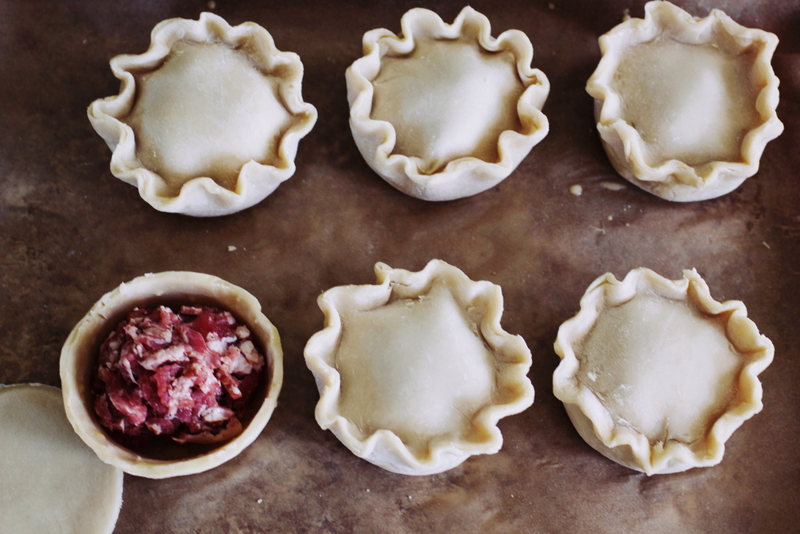 The traditional way is to make small pies that are about 3 inches in diameter and and inch and a half in height. Grab a fist size mound of dough, form it into sphere, then press it down using the canning jar until it’s about 1/4 inch thick and about a 5 inch diameter circle. Press the extra pastry toward the jar to form a cup shape that is about an inch tall. Trim then fill with the meat mixture. Roll out some more dough for the top piece. Repeat process until you’ve used up all the meat. (I like to form all the cups and tops first before filling.) Score the top with an x or cut a small hole on it. Make extra cuts toward the side of the pies. (The holes will help the stock seep in after baking.) Brush with the egg wash. Bake for 30 minutes at 356 degrees F then lower to 320 and bake for an additional 90 minutes or until the pastry is golden. About 30 minutes before the baking is done, bring the jellied stock to a boil and add some salt to taste (if you made it a day ahead of time). Right after baking, ladle the stock carefully over the pies, making sure that it is getting inside the pies. When it has cooled, it should look like the picture below. 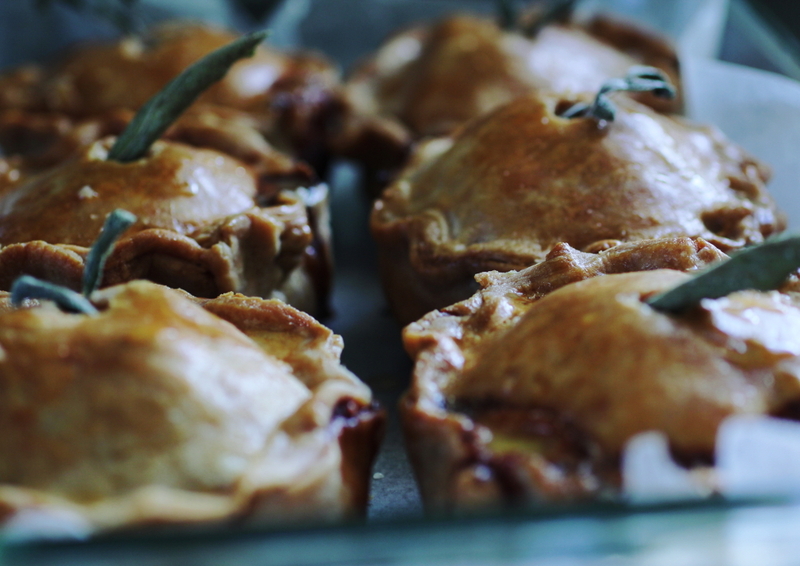 I decorated the pies with some dried sage leaves from my summer garden. Your house is going to smell really good. The best and last part is to mix up some Coleman’s mustard powder with water, slice a piece of pie, dip, and eat! 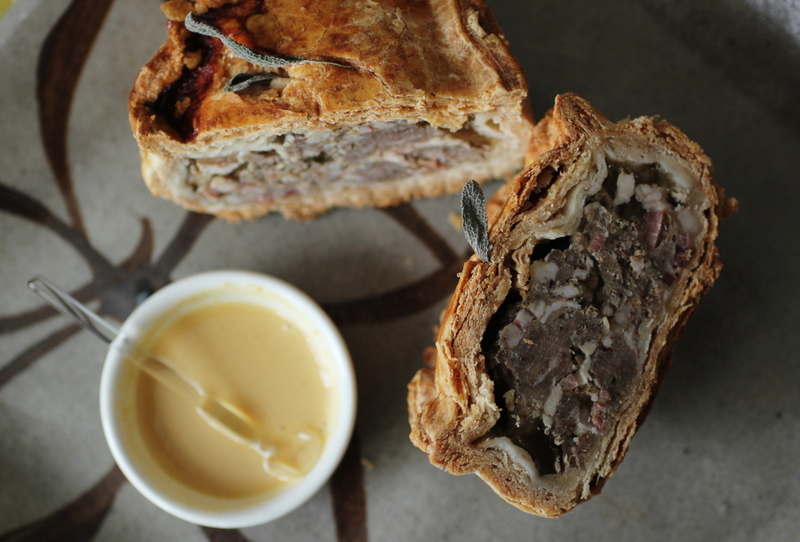 You’re gonna feel a bit of sting from the hot mustard, then experience the many layers of the lard crust pastry, then a bit of stock jelly, and the glorious pork. It is so worth it.